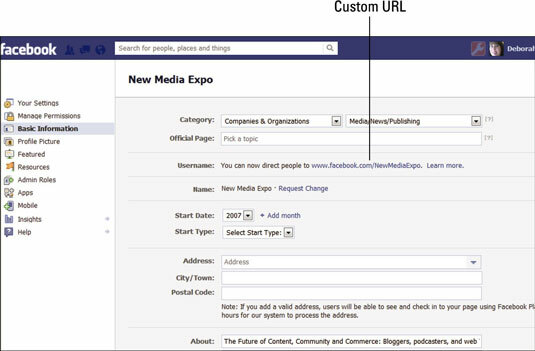 You have the option to have a custom URL for your brand’s Facebook Page. A recognizable URL means better search engine optimization, and people are more likely to remember this address over an address featuring lots of random numbers and letters. Be sure you have at least 25 fans. Only those with 25 fans or more can create a custom URL for their Page. Go to Facebook’s login page. From the drop-down menu, select the Page you want to create a username for. If that name is available, you’re all set. If the name is taken, you’ll have to choose another name. It should go without saying it’s a good idea to choose your brand name as your username. However, if your brand name is rather common, someone may have already beaten you to the punch. See whether you can add another word to your brand name so that you still have that recognizability. Don’t choose a name having nothing at all to do with your brand. This gets too confusing and doesn’t make your Page easy to remember or find.